Lascaux Cave, in southern France, comprises a series of linked subterranean galleries with several large, colorful murals painted by highly skilled Paleolithic artists over 18,000 years ago. The cave entrance was discovered and cleared in 1940 to reveal exquisite galleries in an extraordinary state of preservation. Decay due to moisture and bacterial overgrowth has not touched the paintings' vibrant ochre hues. Thousands of pictorial representations of large animals, humans and geometric figures stand out on a surprisingly intact background, marred in a handful of patches where resurfacing has cracked off. 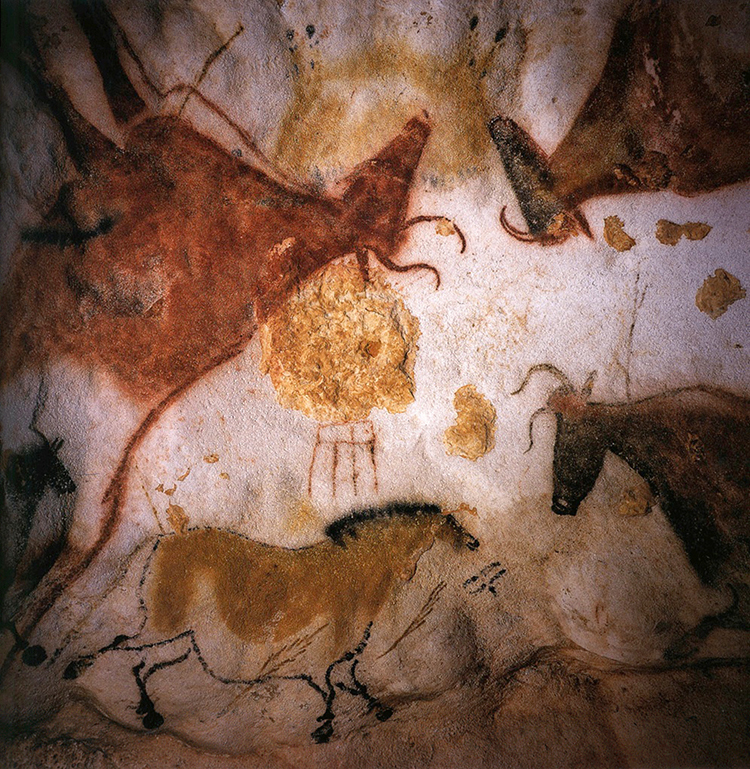 A thick white undercoat of a calcite-based piezoelectric paint was applied by spattering to upper wall surfaces throughout Lascaux Cave, before the painting of animal figures was undertaken (above). 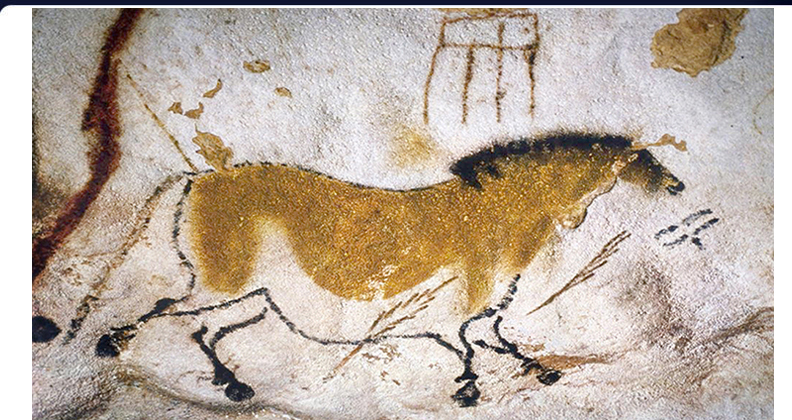 The curvaceous forms of large animal representations are rendered with fine charcoal black and yellow or red ochre lines that were not drawn onto the cave walls. Careful examination of the paintings reveals the use of a simple airbrushing technique. Sharp exhalations made through a small bone tube controlled the spattering of paint from a small reservoir, allowing gradations of color on the whitewashed background. The careful planning, surface preparation, white background basecoat and exquisitely executed airbrush paintings of Lascaux Cave follow the same basic processes familiar to modern artists and interior designers. At Lascaux, animal figures were surrounded by repetitious sets of Paleo-Sanskrit glyphs relating a few basic phrases that have not been identified as writing until the present study. Above a voluptuously rendered dun horse, a bold explanatory statement identifies the increasing necessity of hunting big game for survival, providing the underlying cause as related to the dwindling intensity of planetary infrasound resonance (above): ra-as Indra ris --"For granting of Jupiter diminishing." Another basic repetitive phrase has been written along the lethal trajectory of a spear through the heart of the horse, reading: as-ra ra ra ra-as --"For granting, granting... for granting." The text line marks the vital organs of the prey animal that were specifically targeted by this group of Paleolithic hunters who had completely remodeled and occupied the cavesite for at least several generations. A short form of the same phrase was written in front of the horse's snout, reading: ra-as ra --"For granting, granting." 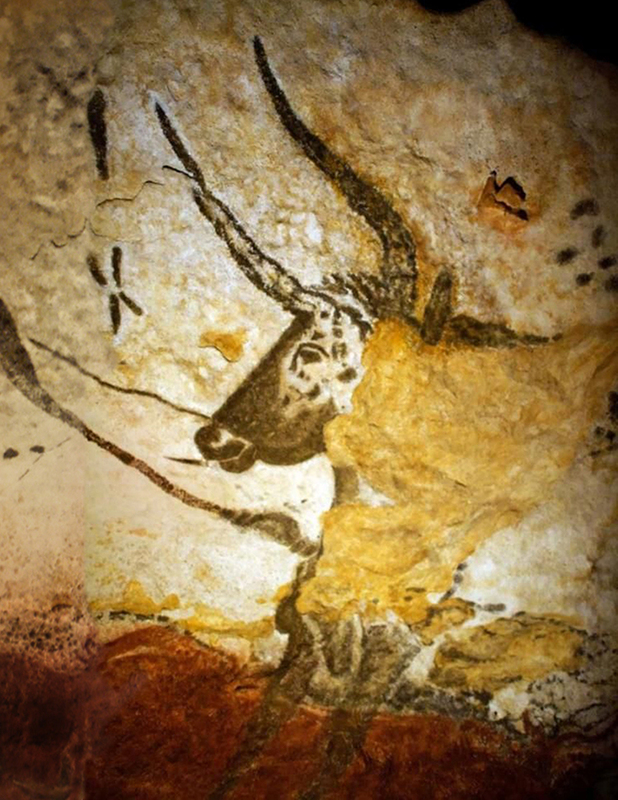 Peculiar statements repeated throughout the Lascaux Cave murals require a cataclysmic context to be correctly understood. The shift to subsistence hunting of big game animals for granting survival likely occurred after a sudden comet-induced catastrophic diminution of planetary infrasound resonance. Throughout the extensive remains of Paleo-Sanskrit habitation sites on all continents, lamentations expressing concern for the diminishing state of planetary infrasound resonance were recorded in hieroglyphic texts through a surprisingly wide variety of techniques. Paleo-Sanskrit authors airbrushed pictorial texts onto whitewashed cave walls; inscribed glyphs into ceramic and stone tablets; carved reliefs on spear straighteners fashioned from antler; engraved spearpoints of bone; and even decorated ceramic cookware with sophisticated sentiments that are only now being fully comprehended. The growing archeological context being uncovered at Paleolithic habitation sites in diverse areas of the globe provide a stunning series of linguistic, artistic and technological continuities that have not been previously identified. Unfortunately, valuable site excavations are often conducted by archeologists who diligently deny the relevant findings concerning antediluvian geopolymer chemistry and the advanced psychoacoustic functions of megalithic temples, greatly limiting the accuracy of their own interpretations. A renewed synthesis of all available information gathered concerning Paleolithic material culture must include analyses of large-scale architectural remodeling of natural caves and the refaçading of entire mountain clusters as precisely oriented pyramid complexes and sacred ceremonial centers. The rapidly growing genetic database of existing and extinct lifeforms must also be taken into consideration. Having been well described by Paleolithic cave mural painters, one particular breed of horse that was once prevalent on the grassy plains of Paleolithic Europe possesses a coat patterning and coloration that are quite distinct, yet share a common genetic ancestry with Africa's zebras. 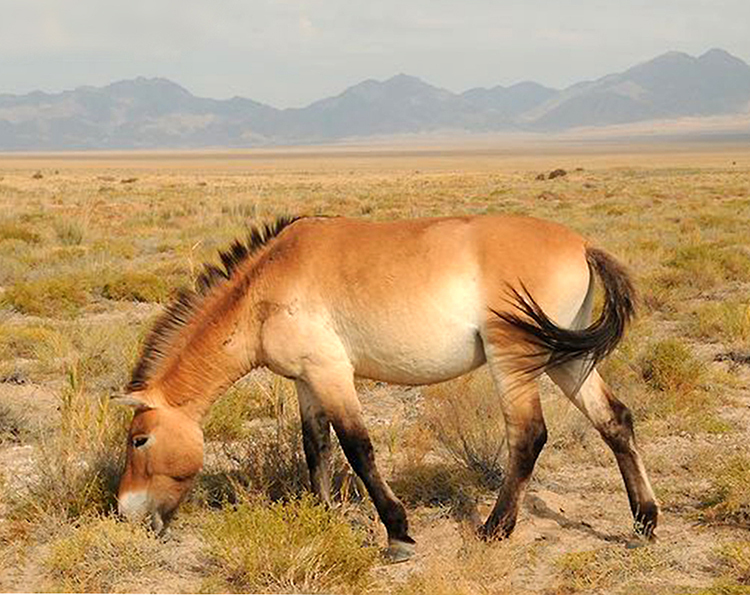 The Przewalski horse breed is closely related to the zebra, both genetically and physically, with quite a similar build and the characteristic short mane that stands straight up (above). Their tawny hues are generally lighter on the underbelly, and contrasted by the much darker brown/black tones of the lower legs, tail and mane. 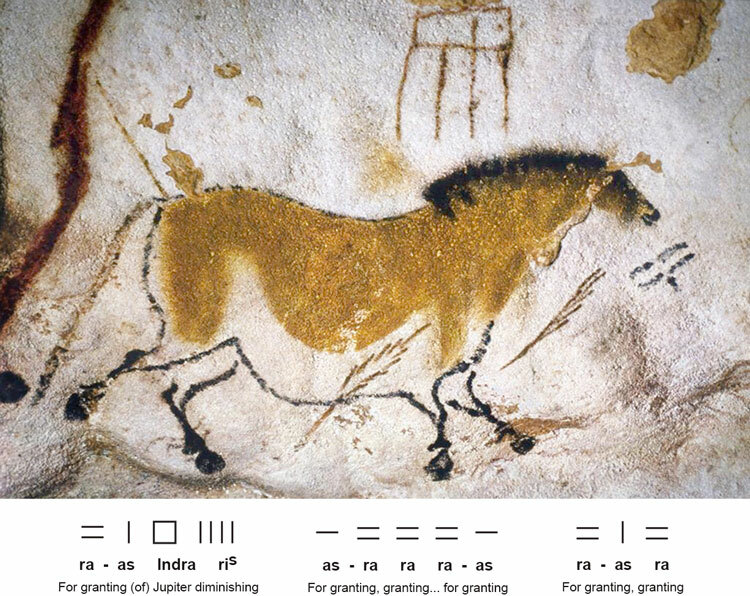 The remarkable airbrush rendering of the dun horse at Lascaux is surrounded by several glyph ligatures that stand apart from the animal's forms, yet glyph sets have also been embedded in the designs of all of the other animal figures from these remarkable airbrush galleries. 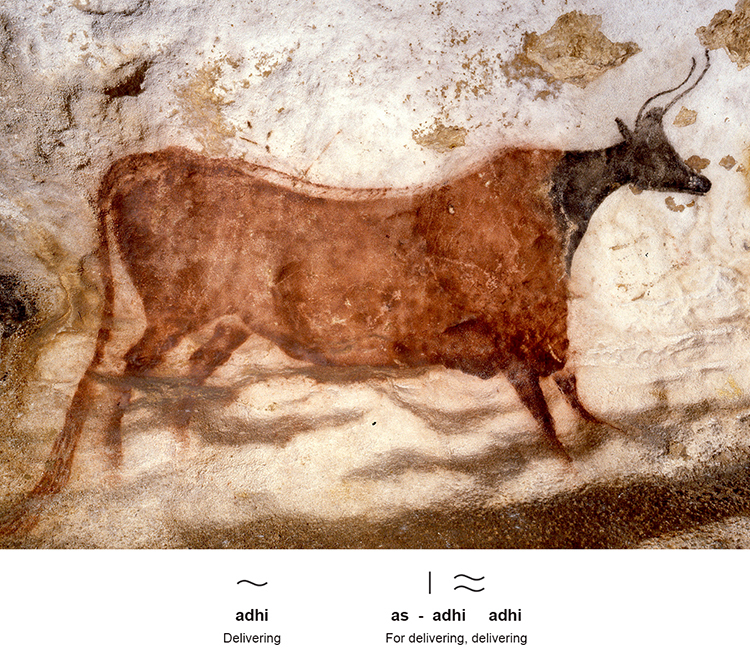 The most prevalent animal among the over 2,000 separate subjects depicted at Lascaux is the oversized wild ancestor of all modern-day cattle that once roamed the grasslands of the Eurasian and North American continents. Usually depicted in profile, the Aurochs is an extinct megafauna species that was carefully rendered by Paleolithic cave artists showing a red/brown coat with a black neck and head. 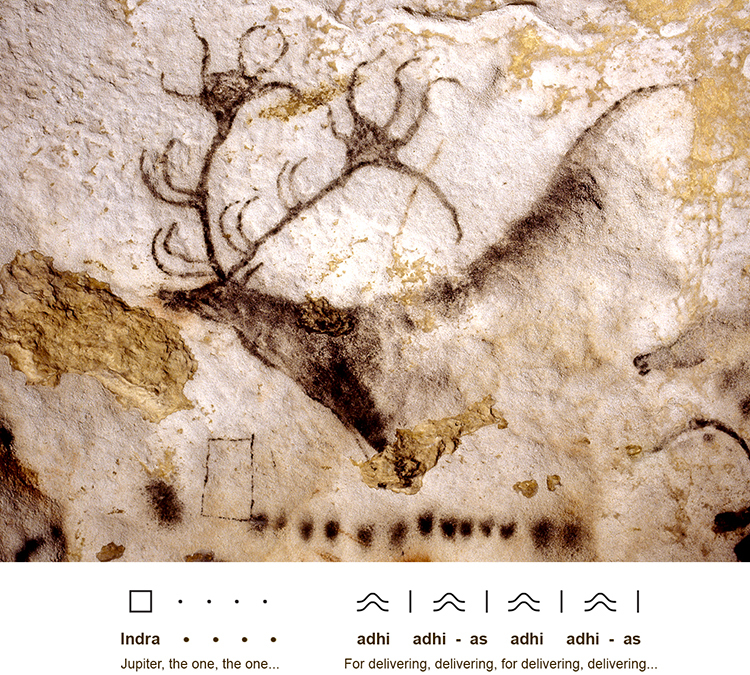 Paleo-Sanskrit glyphs have been cleverly integrated into various elements of each of the many Aurochs pictograms, with the sharply rendered ear and horns of bulls reading as: adhi adhi-as --"For delivering, delivering" (above). 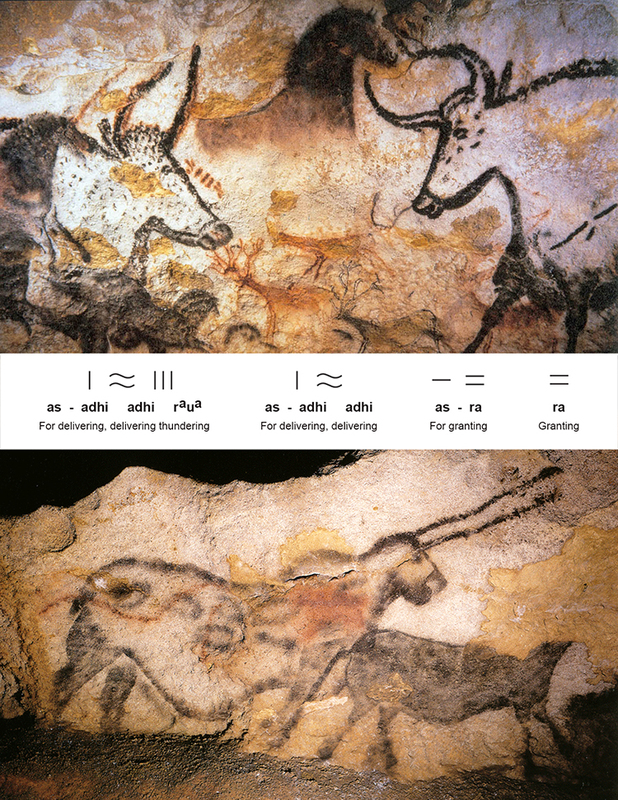 This linguistic interpretation is supported by the consistency of Lascaux's many Aurochs representations --the ancient artists clearly delineated both horns as glyphs, yet only one ear was shown, reading 'as'. A distinctive white stripe running down the entire length of the Aurochs' back along the spine was specifically rendered by the Lascaux airbrush painters and reinforces the horn glyphs by forming a large 'adhi' glyph following the long curve of the bull's arching back. This shape is echoed by the grazer's round belly and rump that seem to conform perfectly to the undulations of the underlying wall surfaces. Simple airbrushing techniques used at Lascaux involved layering spots to give a sense of depth. Here, we present analyses of the first complete nuclear genome from an archaeologically-verified and exceptionally well-preserved aurochs humerus bone sample recovered from a cave site in Derbyshire, England and radiocarbon-dated to 6,738 ± 68 calibrated years before present (laboratory sample code: CPC98)... DNA extracts from the CPC98 humerus bone were prepared for Illumina® short read, high-throughput DNA sequencing. A consensus CPC98 B. primigenius nuclear genome was assembled, using the complete B. taurus genome... We have performed comparative analyses of coding sequences or candidate regulatory regions associated with genes using high-throughput DNA sequencing data from modern B. taurus and B. indicus cattle to identify over 300 genes in which CPC98 and indicine cattle share potentially functional SNP or indel alleles not seen in taurine cattle. A closely related wildlife conservation project has focused on the goal of 'breeding-back' Aurochs for an eventual program for repopulating the European grasslands with wild grazers that will help to rehabilitate the landscape in balance with the return of European wolf populations. 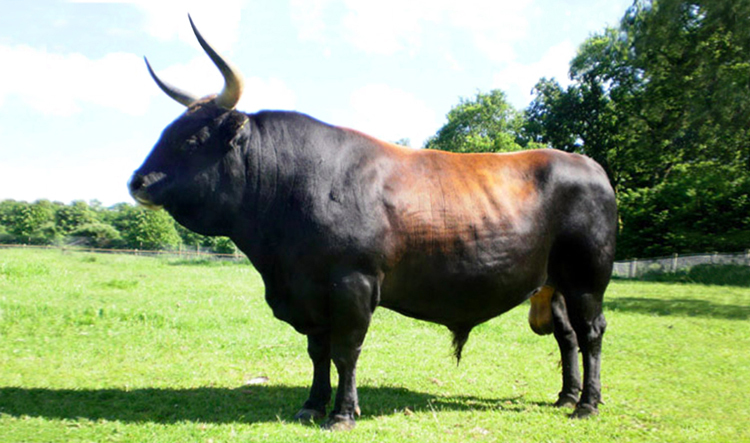 The Dutch Tauros Breeding Program has collaborated with various wildlife conservation organizations to concentrate the existent genetic heritage of the Aurochs by cross-breeding modern-day cattle strains that display many primitive characteristics, such as the Tudanca, Maremmana, Sayaguesa, Pajuna, Limia, Maronesa and Podolica. The ultimate success of such programs may be determined by the longterm influence of drastic ongoing climactic changes on Earth that appear to be rapidly cycling back into another glacial period. Another easily distinguished Paleolithic megafauna species was also depicted by Paleo-Sanskrit artists at Lascaux Cave. Now called Megaloceros, this extinct species of giant ungulate related to elk and deer once foraged throughout the southern portion of the European landmass. 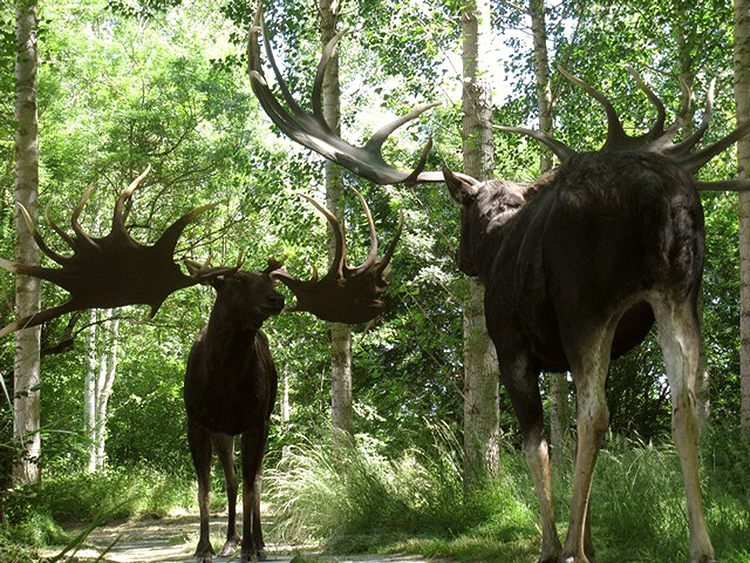 Enormous antlers grown by males to a total span of over 3.5m were undoubtedly used in exhaustive territorial combat for mating dominance, and required strong neck musculature to endure seasonal trials of will and stamina (below). Megaloceros vocalizations reverberating through the open forests of the late Pleistocene must have included deep grunting and loud bellowing sounds that would have been heard during the rutting season from many miles away. For their deep mating calls, Paleolithic cave artists symbolically employed the Megaloceros in pictographic format, referencing the thunderous rumbling of monumental pyramid and temple constructions that operated collectively as a global network during that era of high-civilization. Like the iconic roaring lion pictogram presented on many standing megaliths at Göbekli Tepe, Turkey and the singing whale and rumbling elephant glyphs from the texts of the Illinois Cave archive, the bellowing Megaloceros pictogram references the divine infrasonic influence of Indra. Signified by the square glyph, Indra is the planet Jupiter deified for its beneficial amplification of 33 sacred frequencies of planetary infrasound resonance that vitalize all living organisms. 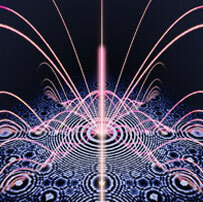 Vedic scientists of the Atlantean world-nation had long ago recognized the piezoelectric transduction of cosmic infrasound resonance by all living cells for catalyzing fundamental atomic reaction cascades that generate the biophoton fields of all life forms. This profound knowledge has been regained and defined as phonon resonance dynamics inducing nuclear reactions between metals and absorbed gases. Electricity passing through the human body increases local energy available for the dissociation of gas molecules bound to metal particles in every cell, thereby enhancing the absorption rates for gases into metals for nuclear transmutation. This underlying electrical metabolism was further enhanced by adepts of the Atlantean sacred sciences through infrasound exposure in conjunction with drinking gold and silver nanocolloids, reverently praised as Soma elixir in the collection of hymns known as the Vedas. Bioelectrical benefits induced by the thunderous resonance of the planet Jupiter were praised in simple statements marked on the walls of piezoelectric cave sites. An airbrushed charcoal ceiling depiction of a bellowing Megaloceros offers a pictorial representation of ultra-low frequency sounds associated with Jupiter's rumbling, above the square glyph rendered in thin black lines signifying the planet Jupiter. A linear series of 13 black airbrushed dots, each representing the Paleo-Sanskrit numeral '1', extends to the right of the square glyph, giving the subject of the mural: Indra * * * * * * --"Jupiter, the one, the one, the one, the one..." (above). Unmistakable repeating glyph sets embedded in the fractal configurations of the Megaloceros' giant antlers complete the mural's full statement, altogether reading: Indra * * * * * * adhi adhi-as adhi adhi-as --"Jupiter, the one... for delivering, delivering, for delivering, delivering..."
Paleo-Sanskrit glyph texts were also inscribed on portable items made from bone, antler and stone. Excavation of the dirt floors of the Lascaux Cave site identified multiple layers from distinct periods of occupation, separated by occupation by cave bears. 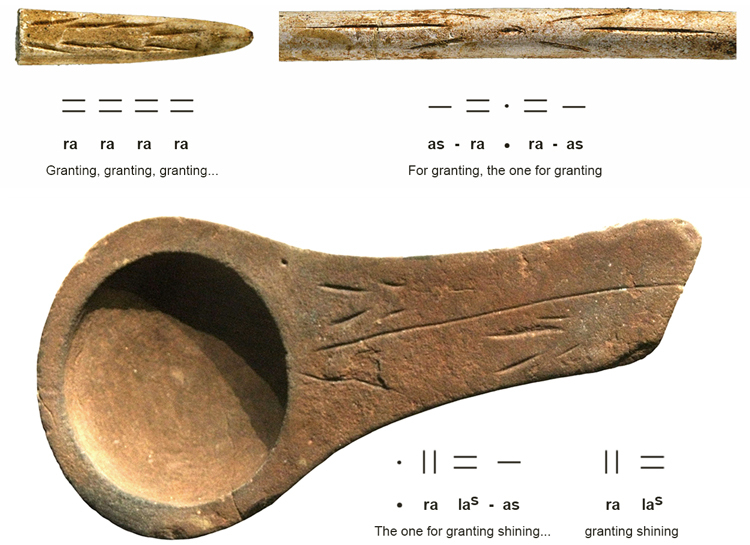 Bone spearpoints recovered from the deepest layers were labeled with their functions: as-ra * ra-as --"For granting, the one for granting" (above). A small sandstone lamp also recovered from the primary layer of human occupation represents the most sophisticated object handcrafted by antediluvian cave-dwellers at Lascaux. This geometrically rendered lamp was carefully formed with an elliptical fuel well and the handle labeled with simple glyph sets repeating its basic function: * ra las-as ra las --"The one for granting shining, granting shining" (above). The quality of the sandstone constitution of the Lascaux lamp has been noted for its exceptional hardness and fine grain size, and was assumed to be a naturally-sedimented sandstone, carefully selected and carved into its present form. However, in the light of novel geopolymer research on Atlantean artifacts from various continents from the Paleolithic period, the exceptional quality of the sandstone lamp may result from a synthetic origin, having instead been mixed and poured according to chemical formulae that have been closely replicated in modern laboratory studies. The astounding breakthroughs in geopolymer chemistry and materials analysis assure that microscopic investigation of the composition of the Lascaux lamp sandstone will conclusively determine the actual genesis of the lamp: carved from natural stone or poured as a geopolymer slurry. The crudeness of the rendering of the hieroglyphs suggests that even if the sandstone has been artificially reconstituted, the labeling of the object was accomplished by carving after removal from a reusable two-piece mold. Artifacts from many of the Neolithic cultures of Europe confirm their preservation of linguistic heritage from the Atlantean Era, in many cases repeating votive passages from before the catastrophic demise of high-civilization ~12,890 years ago. The Paleo-Sanskrit phrase: ra las --meaning "Granting shining"-- was inscribed into mold-made lamps at Lascaux Cave in France ~18,000 years ago and exactly replicated and passed down by hundreds of generations of descendants throughout the region. 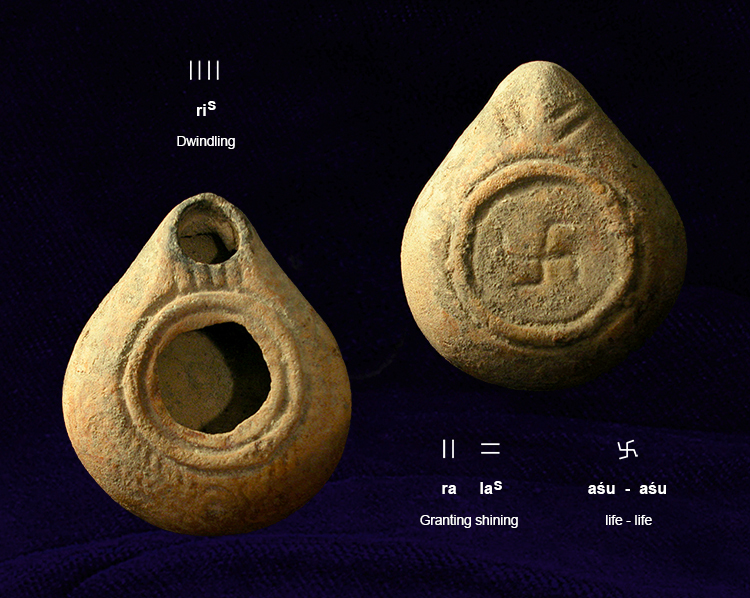 Both the mold-making techniques and identical linguistic patterns have been designed into the refined geometric forms of an Etruscan mold-made ceramic lamp with a refueling port labeled: ris --"Dwindling" (above). The specialized use of caustic soda for production of geopolymer stoneware ceramics at low temperatures achieved in simple raku pit firing processes is another advanced Atlantean technique closely related to geopolymer stone casting processes identified at the world's oldest pyramid complexes in present-day Egypt, Bosnia, Indonesia and Ecuador. Geopolymer ceramic techniques were expertly used by the Etruscan civilization to produce blackware masterpieces several thousand years after the cometary destruction of Atlantis and the subsequent Deluge. Specific use of simple natural components for advanced geopolymerization techniques provides another easily quantifiable means for analysis of ancient sites that must now be widely applied, not only to the pyramids but to all other sites from that elevated epoch, especially at Glozel and the many famous Paleolithic caves of Europe. The remarkable state of preservation observed at these sites is attributable to the ingenuity of interior remodeling techniques on display at Lascaux Cave that reflect more advanced techniques witnessed at other sites in France from the same historical Paleo-Sanskrit period.